Everybody who buys or sells CBD wants to know if CBD is legal or not. If you want your questions answered, watch my interview with cannabis lawyer, Rod Kight. If you don’t have time to read the whole post you can just scroll down to the facts you need to know at the bottom of the post. In December 2016, the DEA declared that CBD is and always has been considered a schedule 1 substance, falling under the same category as “marijuana extracts”. But the situation is far more complex. What the DEA failed to consider is where the CBD is being sourced from. CBD can be sourced from two distinct varieties of cannabis plants: marijuana and industrial hemp. Marijuana is casually defined as a cannabis plant containing more than 0.3% THC (when compared to hemp). A more accurate definition of marijuana is: all parts of the plant cannabis sativa L, with the exception of certain specific parts of the plant, including, the mature stalk, non-germinating seeds, and a few other parts, all of which contain minuscule amounts of THC. Industrial hemp is casually defined as a cannabis plant containing no more than 0.3% THC. The following is a more in-depth, legal definition of industrial hemp ala our favorite cannabis lawyer, Rod Kight: Industrial hemp is a multi-part definition: (1) the plant cannabis sativa L., (2) grown pursuant to a State’s pilot research program, (3) containing less than 0.3% THC on a dry weight basis. I repeat, you can source CBD from both marijuana and industrial hemp. They both contain CBD in varying quantities. The legality of CBD is determined by where it’s sourced from. CBD sourced from marijuana is legal in states who have medicinal or recreational programs for marijuana use. Examples of states like this are Colorado and Washington. CBD sourced from industrial hemp is legal in states with hemp farm bill programs for growing industrial hemp. CBD sourced from industrial hemp is also legal in states which have laws which allow for use of CBD products but may not allow for the use of marijuana products. An example of one of these states would be Kentucky or Texas. See the chart below. 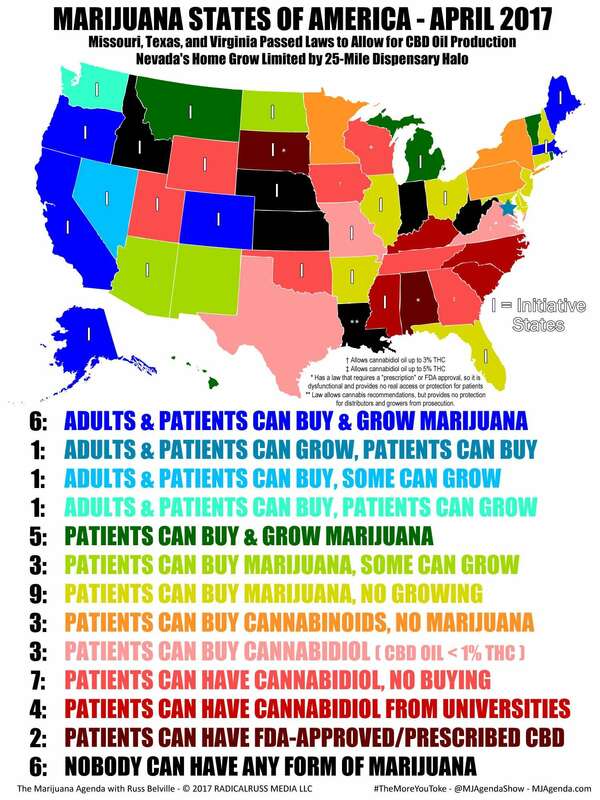 Keep in mind that cannabis laws currently vary state by state. In the future, this may change but for now, each state makes their own independent decisions on cannabis law. What is the “Farm Bill” and why does it matter? If you don’t know what I mean by “farm bill programs”, I will explain that now. In the United States, the Farm Bill is the declaration of policy regarding agriculture released by the federal government (source: Wikipedia). In 2014, as part of the United States Farm Bill, it was stated that certain states would allow for the licensed growing of industrial hemp under the supervision of each state’s department of agriculture. This was section 7606 of the 2014 Farm Bill. You can read that section here, if you are interested. States like Colorado and Kentucky began active industrial hemp farming operations soon after the passing of the 2014 Farm Bill. In addition to hemp fiber and hemp food production, a significant amount of hemp is being grown for the production of CBD products. The DEA mistakenly ignored this in their blanket statement that all CBD is illegal. This is why the Hoban law group, one of the nations leading cannabis law firms, is suing the DEA. See most of the CBD products made from industrial hemp are, like many products, sold online and delivered across state lines to consumers. A few minutes on Amazon yields plenty of search results for “CBD Oil” shipping to all 50 states. So there is an important question which remains to be answered: is shipping CBD hemp oil products across state lines legal? To find the answer to this question I spoke to one of the nation’s best lawyers in the cannabis space, Rod Kight. According to Rod, the above statement from Congress made CBD hemp products legal to buy across all 50 states, so long as the CBD was sourced from hemp grown by a licensed grower in a state with a hemp pilot program. Under this statement, no funding could be used to prohibit the transportation, processing, or sale of hemp products across state lines. Some of the major players in the CBD hemp oil business are sourcing their CBD oil from hemp grown overseas, often in Europe. We at CBD School support domestically grown hemp over overseas hemp for many reasons but this article is about legal issues so we will keep the focus on the law. Internationally sourced CBD is protected under a different legal code than the US Farm Bill. I am referring to a 2004 legal ruling of the case HIA vs DEA. The ruling established that non-psychoactive hemp products containing only trace amounts of naturally occurring THC are, and always have been, legal to import into the US. CBD companies who choose to source from overseas generally extract CBD from the parts of the hemp plant considered exempt from the definition of marijuana: hemp stalks, fiber, oil and cake made from hemp seed, and sterilized hemp seed itself. The current problem is that while many states have hemp laws, there are some states that just don’t have hemp laws at all. What that means is they don’t have laws against hemp, but they also don’t have laws that allow for hemp. What these states have are laws against the use of cannabis in any form, and that includes non-psychoactive products like CBD hemp oil. Examples of these states are Idaho and West Virginia. CBD may be illegal under state law in those particular states since they do not distinguish between industrial hemp and marijuana. However, Rod stands by the legality of CBD because it is not listed as a controlled substance in the controlled substances list. THC is listed, but CBD is not. Rod’s argument is that because CBD is not listed as a controlled substance, and because it is sourced from a lawful plant, it is thus federally legal. This is what he advises his clients. With that said however, Rod still cautions his clients to be careful when shipping to states which have no hemp laws and which lump hemp in with their marijuana laws. With these states, there is a possibility of some interference from the state of the recipient. Rod is currently working and doing his best to clarify the interstate commerce laws regarding CBD hemp products. It is unfortunately not a black and white issue at the moment. Are you sourcing the CBD from industrial hemp grown on a licensed hemp farm in a state with a hemp pilot program supervised by the state’s department of agriculture? Are you shipping your product from a state with a hemp pilot program supervised by the state’s department of agriculture? If you are a buyer of CBD products, i.e. you buy CBD products in small quantities for personal use, you need to be aware of the hemp laws in the state where you live. While this isn’t legal advice, if you’re buying CBD products in small quantities for personal use, you are very unlikely to be targeted by anyone taking legal action. Still, we recommend you know the laws of your state. Most of the legal concerns however will be for anyone who is importing large quantities (bulk CBD products) into a state that doesn’t have hemp laws. The people who import bulk quantities of CBD products are usually brick and mortar retailers of CBD products. These are the people who should be more concerned about the legal status of CBD in their states. I had this fact confirmed by one of the Hoban group lawyers, Garrett Graff. So far, these are the only distributors who have had any action taken against them. Some retailers in CBD unfriendly states have been asked to remove the products from their store shelves. The legality of CBD is determined by its source. CBD sourced from marijuana plants (cannabis plants with a THC content of more than 0.3%) are only legal in states with established recreational and medical marijuana laws. CBD sourced from industrial hemp plants (cannabis plants with NO MORE than 0.3% THC content) is legal in all 50 states. But keep in mind that there are some states in which marijuana is illegal and their definition of marijuana ignorantly includes hemp. In those particular states, CBD hemp oil is a much more gray area. You need to know the laws of the state in which you reside. There are federally exempt parts of the cannabis plant. The federally exempt parts of the cannabis plant are the hemp stalks, fiber, oil and cake made from hemp seed, and sterilized hemp seed itself. While these are not ideal sources for extracting CBD, some companies rely on these sources for their CBD products. These are mostly companies who import their CBD from industrial hemp grown overseas in countries like Europe. The 2015 Omnibus Spending Bill is the savior of interstate commerce of CBD. In that bill, it states that: no federal funding shall be used to interfere with interstate commerce of products made from hemp grown under the rules laid out by the 2014 Farm Bill section 7606. For distributors of CBD: while this is not legal advice, make sure you put some language in your advertising that the buyer is buying at his own risk and acknowledging that CBD hemp oil is lawful to obtain and use in the state where they reside. The safest way for distributors to conduct their CBD hemp business is to source, sell, and ship their CBD hemp products from a state authorized to grow industrial hemp under the 2014 Farm Bill. Another option is to source all of your CBD product from overseas as this is protected by the 2004 ruling of HIA vs DEA. 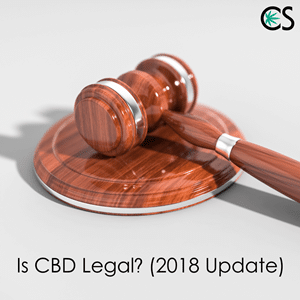 For buyers of CBD hemp products: the individual laws of certain states are really the problem when it comes to CBD hemp laws. Make sure you know the laws of your state. With that said, and again, this is not legal advice: if you are buying in small quantities for personal use, you should be fine and needn’t worry. For people buying in bulk quantities for resale, you need to very thoroughly know the laws of your state. Bulk orders are more likely to draw attention from authorities. Per the FDA, CBD products are NOT ALLOWED to be marketed as dietary supplements. Do not market CBD products as dietary supplements and do not make any medical claims about CBD. CBD laws are changing every day and will likely change again soon. Let’s remain optimistic that cannabis laws will continue to only change for the better so that more people can access the benefits of the cannabis plant. Regarding Legality, there are lots of mess. One of the most asked question by CBD enthusiast is, "Is CBD Legal?" Find one of the most trustworthy information regarding CBD Legality. I HOPE & PRAY TO GOD ABOVE THAT MARIOUNOL IS NOW LEGAL IN ALL STATES!! I’M FIGHTING ESOPHAGEAL CANCER FOR 4 YRS!! BEEN GETTING THE MARIOUNOL 600 ONLINE. I’VE SEEN CHILDREN & GROWN MEN & WOMEN DIE FROM RADIATION & CHEMO THERAPY, WITH MY OWN EYES. HONEST GOD TRUTH, SINCERALLY.WILLIAM KENNEDY! Thanks for sharing your thoughts on this, William. What are your thoughts on the new ruling?? What do CBD sellers do? Can the public still buy CBD as a good supplement? So scary how big-Pharma can introduce a drug that is mostly sugar and artificial and now the real stuff is illegal. Can’t have the competition I presume. Hoping for you it is accessible. If swallowing is hard, Nature’s Sunshine liquid chlorophyll is great for that too. Hey Monica, happy to help. What exactly are your questions on the extraction? so as of today where is it prohibited by the law not buy cbd? Hey Miguel. Thanks for your question. Every state and country has its own laws so it’s always best to check the laws in your exact location. Thank you for explaining the reality of CBD laws, in such a frustrating time where CBD is in a giant gray area. I found the best explanation to be that if it is made from industrial hemp with less than 0.3% THC it is legal, although some states may consider it Marijuana and you could be subjected to be arrested. Why are you guys advertising Bluebird? Just because they are the “biggest” company? Makes no sense. Quality over quantity! Just because Coca-Cola is the biggest, doesn’t mean it’s good for you. Stanley Brothers were sued twice for containing no CBD in their acclaimed products. Please….don’t give in to money and advertising. The only CBD brand legally allowed to be listed as a Dietary Supplement is HempFusion… so that statement doesn’t hold true to all brands. I do have a question… are US based CBD companies allowed to extract CBD from the flower? That’s not listed as part of the Cannabis plant that are exempt. But I see misinformation from many vendors. Hi Chris. Thanks for your feedback. I cannot provide legal advice. My understanding is that licensed hemp producers in the US are allowed to use all of the plant, including the flower. The flower is the only part of the plant with a significant amount of CBD. I’m looking to try cbd oil for the first time. Can you recommend some sites to purchase from? Also how do I know how many mg’s do I need it to be for pain relief? Hey Amanda. Thanks for your question. A listing of some of our favorite CBD brands can be found here. There is no one-size-fits-all dose for pain. Most people who use CBD for pain experiment starting at a low dose and increasing slowly if necessary until they achieve the desired results. I made a video here which was inspired by your question. Thanks for that! Interesting, I really thought CBD oil was completely legal in all 50 states. And I didn’t know that it is a Schedule 1 substance. Hopefully things keep moving forward so both hemp and marijuana products become easily accessible to anyone who might need them – people should be able to decide for themselves if it’s right for them.